Research has shown that losing as little as 2% of total body weight can negatively affect athletic performance. For example, if a 150-pound athlete loses 3 pounds during a workout or competition, their ability to perform at peak performance due to dehydration is reduced. Proper fluid replenishment is the key to preventing dehydration and reducing the risk of heat injury in athletes engaged in training and competition. Weighing themselves before and after practice. 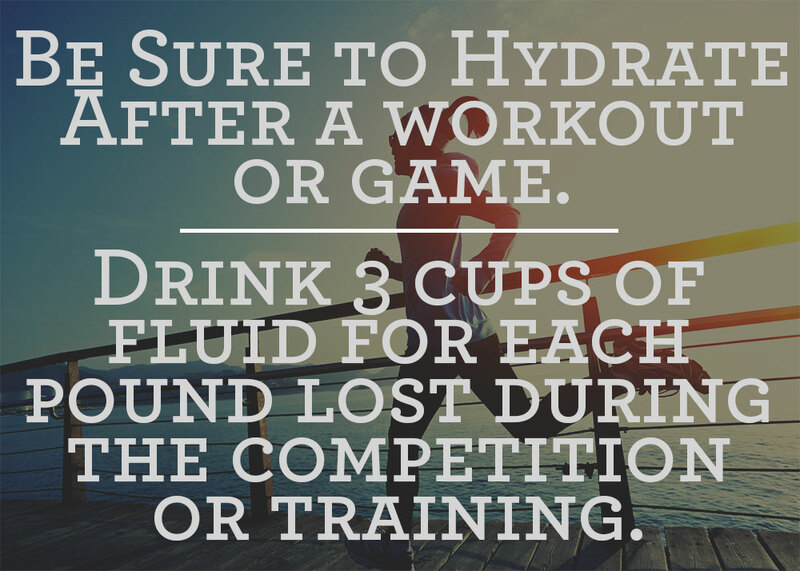 For every pound lost during the workout, drink three cups of fluid in order to rehydrate the body. Checking urine color. Urine that is dark gold in color indicates dehydration. 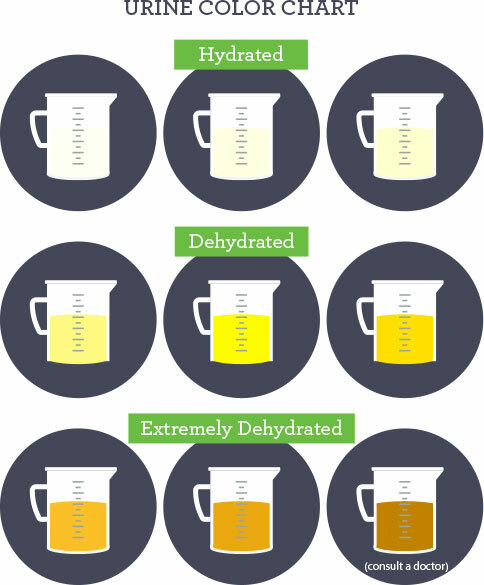 Urine similar in color to pale lemonade or weak tea is a sign of a hydrated athlete. Many times athletes wait to drink until they are thirsty. Thirst is not an accurate indicator of how much fluid an athlete has lost. Athletes who wait to replenish body fluids until feeling thirsty are already dehydrated. As a matter of fact, most individuals do not become thirsty until more than 2 percent of body weight is lost. Waiting until you are thirsty can affect your performance. When athletes only drink enough to quench their thirst, they may still be dehydrated. For best results, keep a bottle of fluid available when working out and drink as often as desired, ideally every 15-20 minutes. Table 12 lists guidelines for fluid replacement from the National Athletic Trainers Association, the American Dietetic Association, and the American College of Sports Medicine. What about fluid replacement drinks? It is now believed that sports drinks containing between 6 and 8 percent carbohydrates are absorbed into the body more rapidly than water and can provide energy to the working muscle that water cannot. A growing body of evidence suggests that consumption of a sports drink containing carbohydrates can delay fatigue and possibly improve performance. It appears that athletes who consume a sports drink can maintain blood glucose levels at a time when muscle glycogen stores are diminished. This allows carbohydrate utilization and energy production to continue at high rates. Beverages containing more than one kind of sugar (i.e. glucose and fructose) can increase carbohydrate absorption rates because each sugar is absorbed via different channels. How important are the electrolytes provided by fluid replacement drinks? The ingestion of sodium during exercise may help with maintenance or restoration of plasma volume during exercise and recovery. The consumption of sports drinks containing sodium helps retain water in the body and aids in hydration by increasing the absorption of fluid from the intestines into the muscles. Recent research has suggested that a 6-8 percent carbohydrate sport drink with at least 110 mg of sodium per 8 ounce serving empties from the stomach just as fast as plain water. Endurance activities lasting longer than 3 hours may require as much as 175 mg of sodium per 8 ounce serving. There has been concern by parents, coaches, and athletes that sports drinks may contain too much sodium. However, many fluid replacement drinks are low in sodium. An 8 ounce serving of a fluid replacement drink can have a sodium content similar to that of a cup of reduced fat milk. Most Americans consume too much sodium through processed and convenience foods, not through fluid replacement drinks. What is an ideal fluid replacement drink? The ideal fluid replacement beverage is one that tastes good, does not cause GI discomfort or distress when consumed in large volumes, promotes rapid fluid absorption and maintenance of body fluid, and provides energy to working muscles during intense training and competition. The following guidelines for maintaining body fluid balance, improving performance in the heat, and preventing heat-related illness appear to be prudent based on current scientific knowledge. For intense training and long workouts, a fluid replacement drink containing carbohydrates may provide an important source of energy. A 6-8 percent carbohydrate beverage is typically most effective in maintaining fluid balance while supplying the muscles with fuel. The fluid consumed during activity should contain a small amount of sodium and electrolytes. The sodium may be beneficial for quicker absorption and replacement of sweat loss. The beverage should be palatable and taste good. The athlete should drink 10-16 ounces of cold fluid about 15-30 minutes before workouts. If the workout is prolonged, add carbohydrates to the beverage at a 6-8 percent concentration. Drink 4-8 ounces of cold fluid during exercise at 15-20 minute intervals. Start drinking early in the workout because thirst does not develop until 2 percent of body weight has been lost, by which time performance may have begun to decline. Avoid carbonated drinks, which can cause GI distress and may decrease the volume of fluid consumed. Avoid beverages containing caffeine, alcohol, and those promoted as energy drinks. If you have never had a sports drink, don’t drink one for the first time on competition day.Practice consuming fluids while you train. Use a trial and error approach until you discover the fluids that work well for you and encourage hydration.